TEL AVIV (JTA) — The soldiers walk past us, two single-file lines between the gravestones, their blank, sunken faces barely visible in the darkness. The coffin appears, hoisted on their arms and wrapped in an Israeli flag. We follow in its wake. Within minutes, some 20,000 people have massed around the final resting place of Sean Carmeli, Texas native, IDF soldier, soon to be declared a Hero of Israel. We stand silent as the rabbi chants verses of psalms begging for mercy. We shrug off official instructions on protocol should a siren sound. Then a broken, crying, panting voice comes over the loudspeaker. Word by impossible word, Sean’s father is saying Kaddish. We say amen, and it hits home: a 21-year-old boy is dead. Mizrachi exhales. Across the crowd, people begin to sob. The eulogies they heard told a story many American Israelis could recognize: Carmeli’s high school principal recounting how he worked especially hard to catch up to his Israeli classmates. Mizrachi recalling how Carmeli would describe his parents in America to his friends in Israel, and his friends in Israel to his parents in America. Carmeli’s brother-in-law telling the crowd about how his house had become Carmeli’s second home, so far from the first. And then there was the story’s sad ending. So much of Israeli life is about remembering the fallen — the sirens on Yom Hazikaron, the monuments across Israeli cities, the shells of tanks on the road to Jerusalem. But we constantly push it out of our minds, focus on day-to-day life, return to our routines minutes after bomb sirens ring out. By time the honor guard fired the final salute, the crowd was already filing out of the cemetery, back to life in Israel. 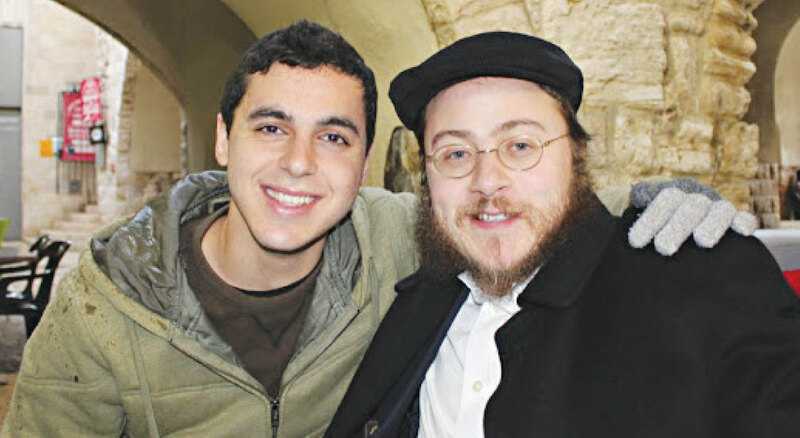 Sean Carmeli and Rabbi Asher Hecht, of Chabad of the Rio Grande Valley, met in the Old City of Jerusalem in 2012, before Carmeli went into the army. The Jewish communities of both Lone Star States lost a treasure Sunday, July 20. IDF Sgt. Sean Carmeli, of South Padre Island, Texas, was killed in heavy fighting in a Gaza City neighborhood. Max Steinberg, a Los Angeles native who joined the Israel Defense Forces in 2012, also was killed during the same clashes with Hamas. The two were among 13 in the Golani Brigade who died. “I share this sentiments,” wrote Rabbi Hecht, “and know that all who knew him feel the same. “Our hearts go out to his parents, our dear friends, Alon and Dalya, and their dear daughters, Gal and Or. They lost their only son today. Their only brother. The vacuum left by this tragedy will never be filled. All we can do pray that G-d brings comfort to his family and all who mourn him. According to Rabbi Hecht: “Sean was a smart boy, very warm, compassionate and loved by all. He was a proud Jew. Sean attended our Chabad overnight camp, Camp Gan Israel-South Padre Island, from its first summer and all the summers following until he was too old for the program. He was such a great kid and a wonderful example to the other campers. He had a strong love for Judaism and for his fellow Jews. He had great energy, yet had a kind and gentle soul. “Sean’s parents made the decision to move back to Israel, where he completed high school and went on to join the IDF, where he served with honor and distinction in the Golani Brigade. “Growing up on South Padre Island, Sean did not have the opportunity to attend a Jewish school, yet just before it was time for him to enter the army, Sean made a decision to spend some time in a yeshiva. On a visit to Israel, my wife and I met up with Sean in the Old City of Jerusalem where he was studying, and he expressed to us just how excited and happy he was to be able to dedicate this important time in his life to study Torah, hoping that it would open his horizons and give him the right perspective before starting his army service and influence his life as a proud Jew. Rabbi Hecht further described the Carmeli family: “It is a close and loving family. They have a warm and open home. Community is very important to them. On South Padre Island, they would host large Shabbat and holiday dinners for the whole community in their home. They also opened their home to Chabad’s Roving Rabbis and to myself and my wife in our first summers on the island.